Sample plutocrat: William Henry Vanderbilt (1821 - 1885). Famous quote: "The public be damned." 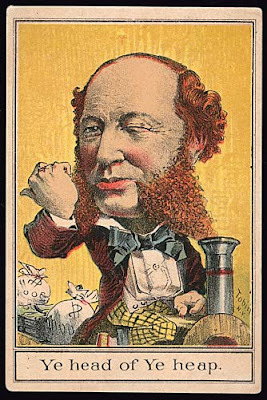 From Famous Person Caricatures / TradeCard.com. 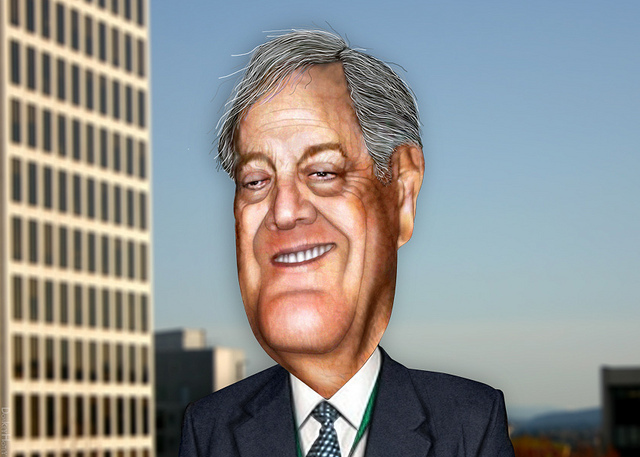 Inset image below: Modern day robber baron David Koch. Caricature by DonkeyHotey. The quote by Thomas Jefferson above is just as valid today as it was a couple of hundred years ago. When he said it, the choice was between being ruled by royalty and their appointees or a rule by the people. The Revolutionary War ended the rule by royalty, but it did not end all of America's problems or firmly establish a lasting democracy in this country. Jefferson knew that democracy was a never-ending fight, and that there would always be those wanting to seize power away from the people. In the United States, those who have wanted to seize that power for their own benefit have mainly been the robber barons -- and their preferred method of doing that has simply been to buy that power (although they have never shirked from using violence, mainly through their surrogates in the political establishment and the police). By the early twentieth century, these robber barons had nearly succeeded in destroying democracy and establishing rule by themselves -- a plutocracy. The United States was saved from that effort at establishing a plutocracy (rule by the wealthy class) -- but it took the greatest economic disaster of the twentieth century to wake up voters and spur them to seize their country back from the robber barons -- the Great Depression. The greed of the robber barons caused them to overreach, and that overreaching caused the most serious depression the country had ever seen. Voters replaced all (or most) of the politicians that had been bought by the robber barons with politicians that had the benefit of ordinary Americans as their primary interest. These politicians (Roosevelt Democrats) began to reestablish economic justice through a variety of measures like government job creation, higher taxes on the rich, Social Security, and sensible regulations on banking and investment. The robber barons (and their Republican lackeys) whined that the measures would destroy America, but they only destroyed the plutocracy and reestablished democracy -- and the country began to emerge from the plutocratic depression. After World War II, the economy had fully recovered, and through new measures like the GI Bill and increased union power, the country prospered like never before. And this prosperity was further enhanced by the War on Poverty, Medicare and Medicaid, and the Civil Rights Acts. The country was well on its way to establishing a strong democracy with equal rights and economic justice for all citizens. But perhaps the most nefarious of these new political messages was trickle-down economics. Through a concerted propaganda campaign, they convinced many people that the way to economic prosperity was to deregulate corporations and the financial industry, and cut taxes on the rich. The idea was that by feeding ever larger amounts of money to the rich and the corporations, much of that money would trickle back down to ordinary American in the form of rising wages and new job creation. The truth is that it was simply a return to the economics of pre-Depression era America -- and it didn't work back then and doesn't work today. The rising wealth of the corporations and the rich didn't raise wages for anyone but the rich -- who have seen their income rise by over 270% since the trickle-down economic theory was put into effect under Reagan, while the wages of ordinary workers have remained stagnant (and in fact, have actually lost much of their buying power). Instead of raising wages or creating jobs, the rich just fattened their own bank accounts. And this had the same effect it did in the early twentieth century -- it threw the country into a serious recession (depression?) and threw millions of Americans out of work (which was exacerbated by corporate outsourcing, which continues unabated). Now we stand at the same place our forebears did in the Great Depression -- on the edge of greater economic disaster and plutocratic rule. Will we reestablish economic justice and democratic rule, or will we give in to the robber barons this time? The answer is anything but certain. Many Americans still buy the lie of trickle-down economic theory, or have fallen for the diversions created to fool them into voting against their own economic (and democratic) interests -- like defending religion (against a non-existent war), pro-life (for the fetus only), patriotism (putting a pink sticker on a vehicle and continuing wars that can't be won), low taxes (but only for the rich), and traditional values (opposition to rights for anyone but white men).